This article has a more “rah, rah, NASA!” tone than most on Universe Today. It is not a welcome difference. 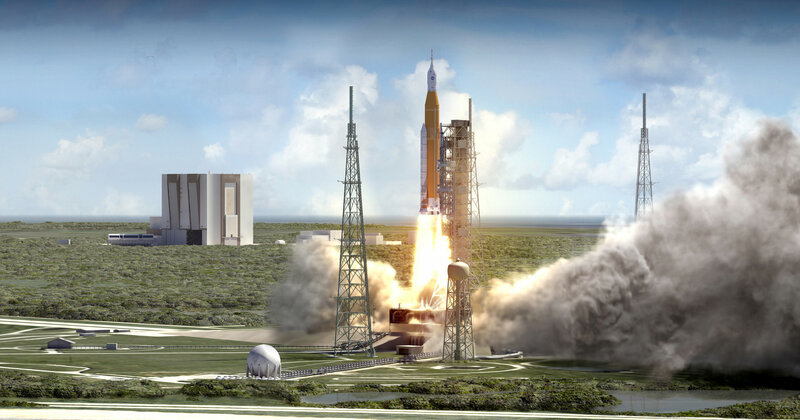 The touch of calling SLS a “Mars Rocket” is another unwelcome step in the same direction. I’m a big fan of NASA, but we’re a long, long way from going to Mars, and NASA needs to own up to the remaining challenges. I don’t know how officially NASA it is, but people there are talking about a mission to the moons of Mars 2031. That seems quite realistic since it would be much easier than a surface mission, and with longer stays on the ISS microgravity is becoming a familiar terrain. Sure it could’ve been better. Undeveloping a reusable engine to a non-reusable one, is going against the current trend in the launcher business. SLS is very expensive and boringly old fashioned. But that is how government does things, everything. A government is a huge waste and destruction of society. But I rather see it doing this than something else. It is specifically very, very Congress. NASA, ULA, and SpaceX all did presentations to Congress, several years ago, indicating that they could build heavy lift launch vehicles in half the time, and for between 1/4 and 1/2 the cost, of SLS. However, by selecting SLS over all these other proposals, Congress specified engineering aspects of the rocket that would guarantee that only certain companies – within the states and Congressional districts of influential members of Congress – would be the only companies that could possibly meet those contract needs. Consequently, we have a ridiculously expensive launch vehicle that will not make its first crewed launch until the beginning of next decade, when we could have had one launching sooner and for far less money than SLS. That’s not NASA’s fault – the fault lies squarely with Congress (and with members of both parties). It’s at the least a bit disingenuous to talk about this remarkable machine- and indeed it is remarkable- without mentioning the stunning costs and the political turmoil associated with flying it. Appropriate, too, would be mention of another huge rocket in development- Falcon Heavy- which while providing somewhat less throw weight initially is about a third the cost to operate and is being developed by a private company without government funds. Costs are notoriously difficult to discuss, but it’s safe to say that FH is MUCH less costly. And finally that FH is largely reusable (which remains to be proven, true). (Yes, I know, SpaceX has contracts with NASA, and indeed received COTS funds for Falcon). Absolutely correct. Work on the Falcon Heavy was started after SLS, and it should be flying sooner, and more often. And of course you’re correct about the relevant costs. ‘Disposable’ SSME’s? Yeah.. why not? The original design for the RS-25 predicted ten flights between overhaul and a vacuum specific impulse of 455 seconds. Neither goal was achieved – vacuum impulse was 453 seconds, and the engines had to be pulled, inspected, and refurbished after each flight. And THAT cost a lot of $$! Ergo the logic about single use for the STS? Still, I’d have preferred to have seen a more robust design like ULA’s Vulcan concept? Or SpaceX’s heavy lift with it’s soft landing concept. With the Vulcan, the rocket engine assembly separates from the 1st stage booster. then re-enters the atmosphere separately and parachutes down for recovery. Not quite as good as SpaceX’s concept, but still has a potential cost savings. Will those engines also have to be extensively inspected and refurbished after each flight? Presumably so, even though the engine module will be recovered by helicopter instead of using a more corrosive ocean landing and recovery.